Well, it's started raining in the Pacific Northwest. 'Tis the season for taking a jacket everywhere you go - even if you leave the house and it's 72 degrees and sunny... it won't be for long! My husband and I have lived in the PNW for 8 years now and while there is a saying "Don't like the weather?? Wait 10 minutes," it's hard to get used to being so invested in what the weatherman claims the day will bring. Weather changes this dramatic brings a pretty swift change to our dinner menus. Soups, casseroles, pastas all come back with a vengeance! I love this casserole! It's totally comfort food and it's super adaptable. 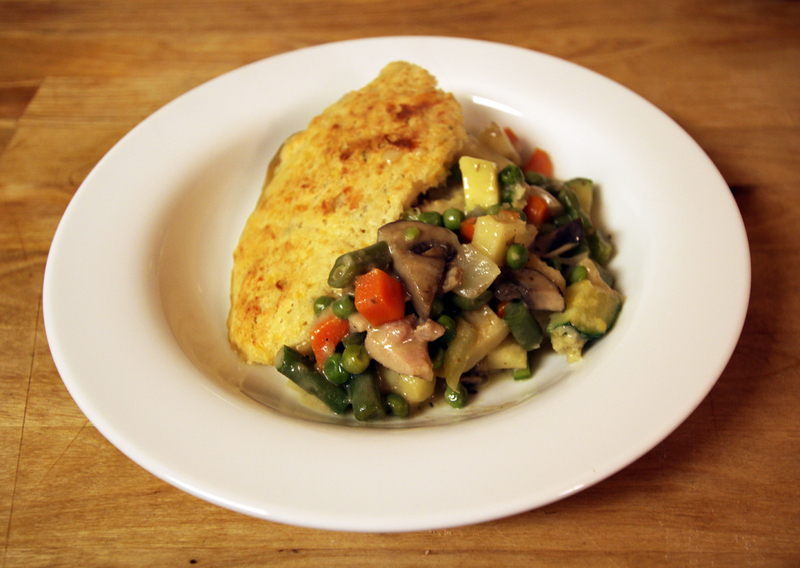 I make this with cheesy biscuits, a lot of veggies and only a bit of chicken. In a food processor, combine flour, butter, baking powder, salt, cheese and sage. Pulse until well mixed and butter is in small, pea-sized bits. Pour in milk while pulsing until everything is just combined. Set aside while you prepare the rest of the meal. In a large skillet heat half of the olive oil and cook onions, carrots, celery and potatoes until onions start to get translucent - about 5 minutes. Then add green beans, mushrooms, zucchini, thyme, salt and pepper. Turn down the heat to low and continue to cook. In a second skillet, heat the other half of the olive oil and cook chicken. Add chicken to the veggies and add cream of mushroom soup and milk. Stir to combine and heat through. 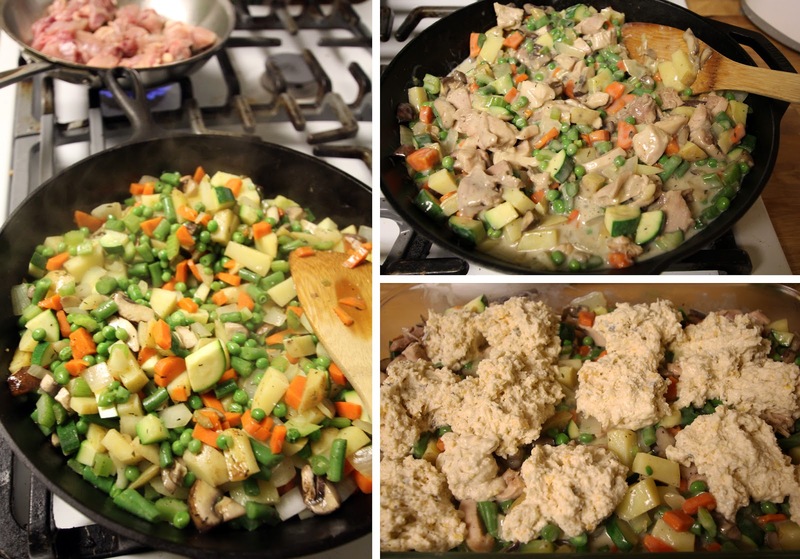 Pour the chicken and veggie mixture into a 9x13 glass pan, or other large casserole dish and top with biscuit dough. 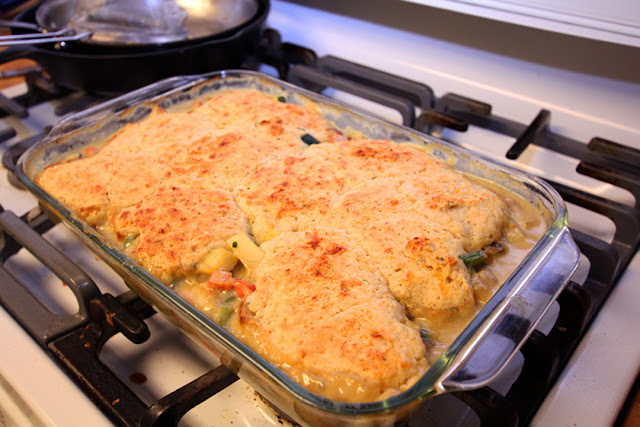 No need to spread the biscuit dough around - it will spread to cover most of the veggies as it cooks. Cover with foil (I spray the inside of the foil with cooking spray to make sure the biscuits don't stick.) Cook covered at 375 for 20 minutes, uncover and turn up the heat to 400 and bake another 10-15 minutes, or until the biscuits are well browned on the top and the filling is bubbling. Like I said, this is a really adaptable recipe. I find this a great way to clean half used bags of veggies out the freezer, or use up fresh veggies when I've gone nuts at the farmers market. Hate green beans? Leave them out. Love butternut squash? Add it in. Have 3 half used bags of frozen corn? Throw one in. Hate mushrooms? Leave them out and try cream of celery soup. Vegetarian? Don't use chicken at all. And... if you haven't had a chance, join our email list! To join, send your name and email address to nopressurecookercontact@gmail.com.